This is a sturdy, mounding shrub, around 3 feet tall and 6-10 feet wide at maturity. It has broad but smallish, blue-green leaves, bronze in new growth. 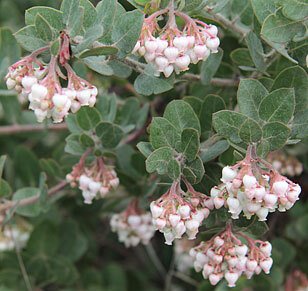 The late winter flowers are light pink, and the berries nearly crimson. Sun, well drained soil, occasional to no supplemental watering once established.